As a parent, you may not be ready to get your kids a cat or dog, no matter how much they’re begging for a pet. Have you considered starting them out with an exotic or “alternative” pet? Consider these suggestions from a Waterloo veterinarian. A rat may not be the first thing you think of when you consider a great pet for kids, but the truth is that rats can make wonderful family pets. They’re better for children than hamsters or mice, because they’re less skittish and easier to handle safely. Rats are social animals, so they may be happiest when paired with another rat. Ask your vet for more information on these often-forgotten pets. Small lizards like leopard geckos or anoles can make good pets for kids who are prepared to commit time to pet care. These lizards don’t get very large, and will spend time on your hand or lap once they’re used to you. As long as children can be gentle and keep a watchful eye on the pet, they can provide hours of fun and fascination. Your veterinarian can tell you more about the specific housing requirements for these lizards and give you an estimation of possible cost. Guinea pigs may not exactly be considered exotic, but they’re a classic choice for children’s pets. 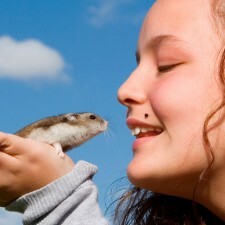 If they’ve been well socialized, they’ll be friendly, curious little rodents who enjoy human interaction. Make sure your children know how much work will have to go into owning a pig, though. Cleaning the cage, refilling food and water, and spending quality bonding time with your pet are all essential. You may not have considered the hermit crab as a good exotic pet for kids, but their low-maintenance nature makes them great choices for younger pet owners! Since hermit crabs don’t need to be let outside, taken on walks, or groomed, they’re great for kids who may not be ready for a larger responsibility. Of course, they won’t interact with their owners like other pets, but they are a lot of fun to observe and maintain. Consult your Waterloo veterinarian for more advice. Don’t rule out the exotic or less-common pet options—you just may find the perfect fit for you and your kids!